Easter is such a fun time- spring is starting to bloom, or some years, it’s in full bloom already. The weather is finally getting nicer, you can put your winter coats and snow boots away (huzzah! my favorite part, for sure). Easter is a special day on the religious calendar, and the reason to celebrate the holiday. We also celebrate with fun treats and baskets to celebrate spring, which has come to be associated with the holiday as well. I have several relatives that love PEEPS, my son being one of them. PEEPS are one of his favorite treats, for Easter and honestly every holiday that they are made for. He just loves them. Mommy makes sure his Easter basket is always full of PEEPS in every shade and variety she can find. PEEPS® Party Cake Flavored Marshmallow Chicks Ten delicious vanilla cake flavored marshmallow chicks sprinkled with fun rainbow confetti. 28 calories per Chick, fat-free and gluten-free. Available in a 10 count package. PEEPS® Blue Raspberry Flavored Marshmallow Chicks Ten blue chicks that bring sweet and tart flavors together like never before create a ‘berry’ delicious taste experience. 28 calories per Chick, fat-free and gluten-free. Available in a 10 count package. PEEPS® Sour Watermelon Flavored Marshmallow Chicks Sweet and sour flavors collide to create a burst of watermelon in these ten green chicks with a blush pink center.  28 calories per Chick, fat-free and gluten-free. Available in a 10 count package. 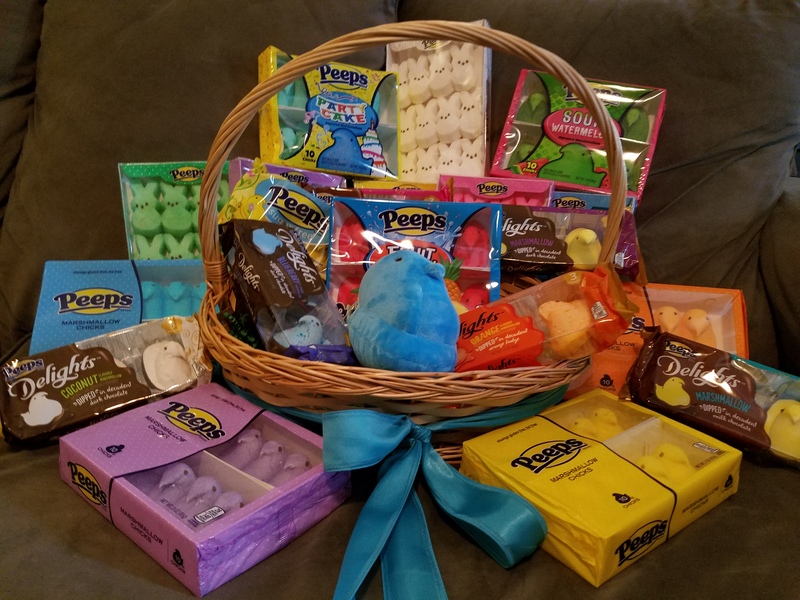 PEEPS® Marshmallow Bunnies The classic PEEPS® bunnies come in yellow, pink, lavender, green blue and white. (Note: Some colors only available in certain pack sizes) 28 calories per Bunny, fat-free and gluten-free. Have a happy, PEEPS filled Easter, everyone! 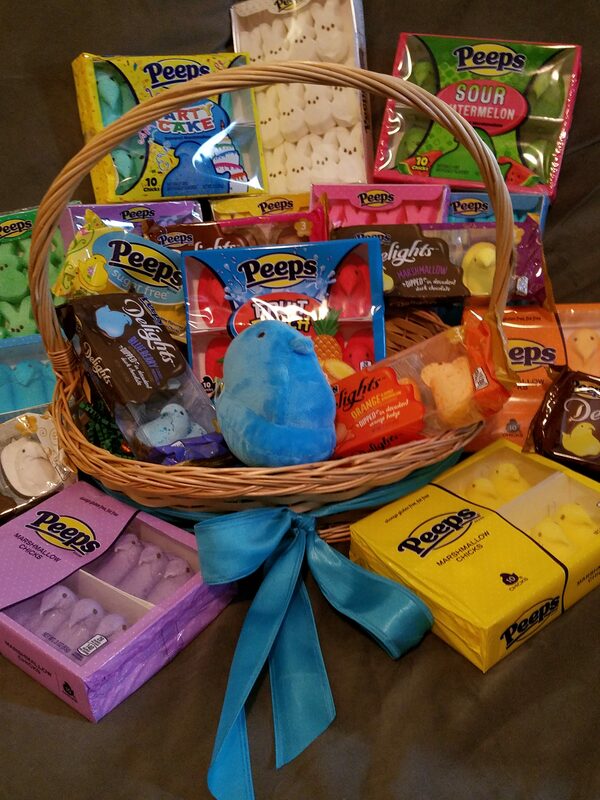 Feel free to use this RC below to enter to win a random assortment of treats from PEEPS. Good luck- this giveaway ends May 2, 2017. Good luck! I would give this to my son and daughter although hopefully they would give me one or two. I would give this to my mom, who absolutely LOVES Peeps!! Well I do love Peeps! myself but I would share with my family if I won. I would give this to my daughter. She loves peeps! i would love to give this to my kids. they will love it. I would win GREAT points by providing this great prize to my daughter-in-law! I’d share this with the whole family since there are so many goodies in here. I’d give this to my niece and nephews. I’d give this to my coworker. I’d share with my two teenage sons. We like Peeps. Thanks. This would be for our kids to share and fight over!! I would keep it for myself. I love peeps! I’d share it with my boy. I would give this to my daughter; she loves Peeps! I would give this to my husband. He loves peeps. My son for sure! He loves peeps! I would send it to my son who is always at work and b]never just to enjoy. Oh I would love to give it to our little one. Oh he is such a huge Peeps fan! This will be for my husband and myself-we might share with the grandchildren! I would keep this for myself. Peeps are my guilty pleasure! I would give this to my twin girls to share. I would share it with my girlfriends. I would give it my niece. She absolutely loves peeps. My mom got her hooked on them because she’s been obsessed with them since I was little. My daughters are HUGE Peeps fans. I would have to surprise them with this if I won! I would give it to my kids. They love peeps. My daughter would be under the mistaken impression that she would get them all, but I would insist that they be shared – with me! i would share with grand babies. Happy Easter. I would share with my son and niece and nephew. I would give this to my granddaughter, She would enjoy all the goodies.